At the next thoughtful tasting next week with The Girlfriend Factor, you'll learn to make sense of wine scents. We found a wine that makes a great bridge between the first two aromatic whites and the last two spicy reds − Gewürztraminer, a white wine that's both aromatic and spicy. 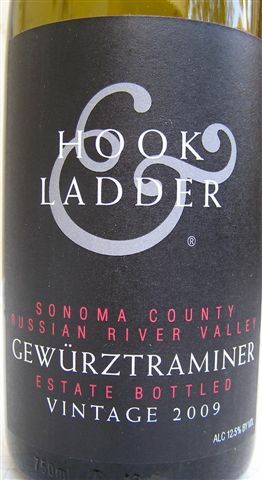 Grown in the cool climate of Sonoma's Russian River Valley, the 2009 Hook & Ladder is a tasty example of this versatile varietal. A quick swirl releases aromas of ripe melon and tropical flower blossoms. On the palate, clean flavors of green apple, honeydew and a hint of lychee come to a spicy gingered finish. Not to be confused with their sweeter late-harvest wine, Hook & Ladder's early harvest Gewurz is barely off-dry. It makes a terrific pairing with spicy and Asian fare, curries, simpler chicken and fish dishes (chutney or mango salsa, anyone?) or just some fresh fruit and cheese. Remember this one in summer for melon and prosciutto, too. The winery takes its name from owner and winemaster Cecil De Loach's first career as a San Francisco fireman. For nearly thirty years before De Loach winery was sold in 2003, his Pinot Noir, Chardonnay and Zinfandel wines brought worldwide attention to the Russian River Valley region. The district was designated an American Viticultural Area (AVA) in 1983 and the appellation's boundaries were expanded in 2005. Today, Cecil and the next generation of the De Loach family continue to develop that region's potential for top-flight viticulture in Sonoma's coastal fog belt. Get with Gewurz for a refreshing change of pace or just the right wine complement to spicier or fruit-laced dishes. Sign up here to give this a swirl next week and learn more about this under-appreciated varietal. Find it for around $12 at Dan's Wine Shop in Palm Desert.